You probably know that insect eyes are a bit weird. Their compound eyes are made up of thousands of repeating units, rather than one big one like other animals. Now, researchers at Germany's Fraunhofer Society research institute have adopted a similar strategy to build an ultra-thin smartphone camera. Called 'facetVISION', the prototype has a lens that's partitioned into 135 tiny facets, each with a different viewing direction. Positioned close together, each facet sees a small section of its surroundings. Those small views are then aggregated together into a larger image. 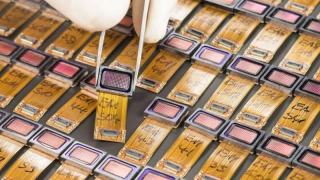 "This technology, taken from nature's model, will enable us to achieve a resolution of up to four megapixel", said Andreas Brückner from Fraunhofer, who is managing the project. The benefit of this approach is that it can deliver far thinner cameras than traditional lens technology. The prototype lens is two millimetres thick, compared to a traditional smartphone camera that must normally be at least five millimetres thick to show a sharp image of its surroundings. It can also be easily mass-produced, using similar processes to those used in the semiconductor industry. By using injection-molding techniques, Brückner believes the insect eye model can easily be transferred into production cameras to achieve a compromise between the two technologies. "The combination of facet effect and proven injection-molded lenses will enable resolutions of more than 10 megapixels in a camera requiring just a thickness of around three and a half millimeters," he said.